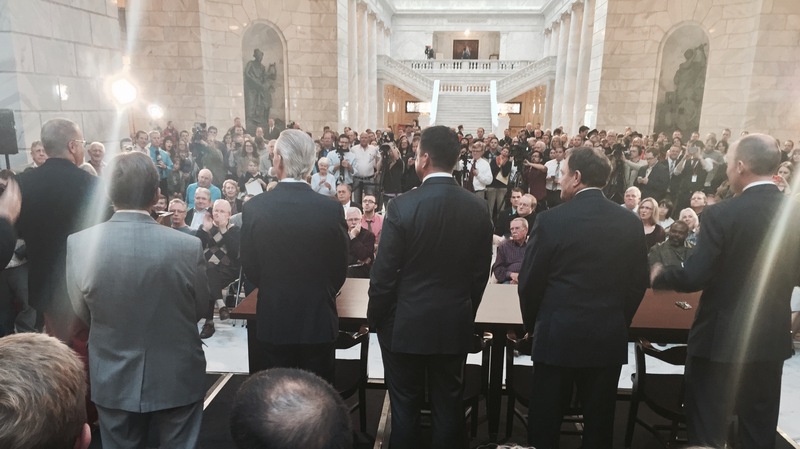 One of the great things about the Session is all of the buzz at the Capitol. It is wonderful to see so many groups so passionate about issues that are important to them. 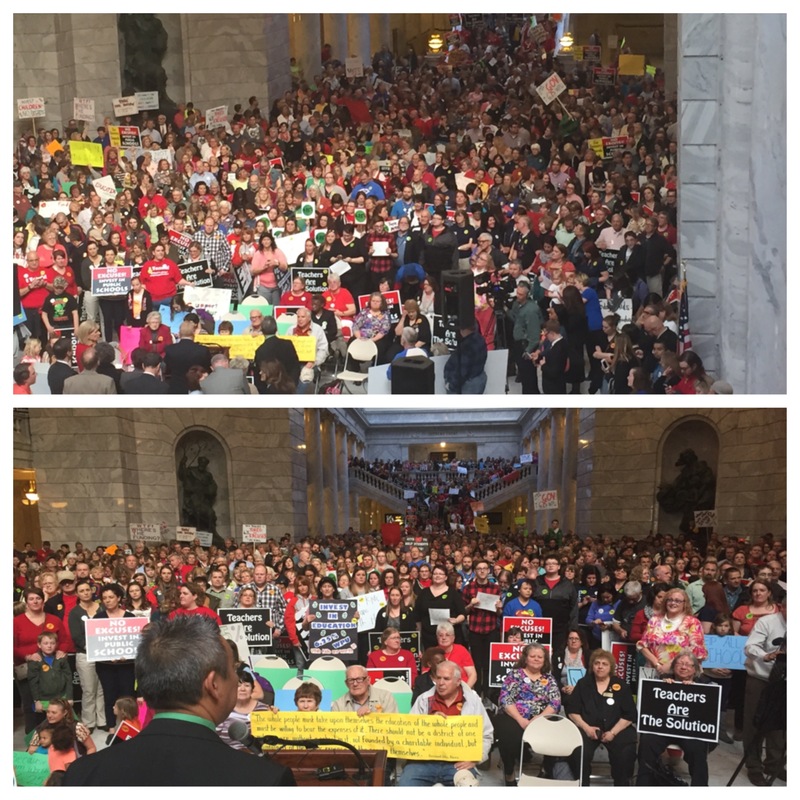 This week we had some of the largest rallies I've ever seen at the Capitol, including this one for education. Regardless of what side you are on, it is great to see a forum where concerned citizens can express their views. 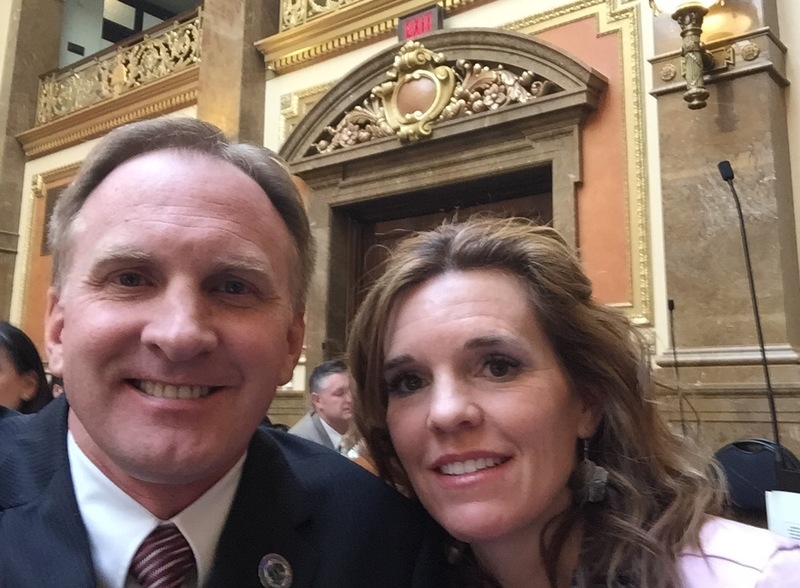 Here's a photo of my wife who came to visit at the Capitol this week. I'm so grateful for my family's support throughout the legislative session. HB154 exempts a nursing mother from jury duty. There are some judges that already dismiss nursing mothers from jury duty. But others do not. This bill would make it mandatory. Here's a great story regarding the bill. HB120 - Modifications to Election Law - PASSED! - I am the chief sponsor of this bill. Passed 66-4 in the House and 24-0 in the Senate. HB248 - Campaign Finance Reporting Revisions - PASSED! - I am the chief sponsor of this bill. Passed 53-15 in the House and 25-0 in the Senate. This bill proposes a change to the fine structure when political candidates fail to report their campaign donations on time. The current structure excessively punishes late reporting for small contributions, compared to late reporting of large donations. This bill will fine late reporting for both small and large contributions at the same rate. HB348 - Criminal Justice Programs and Amendments - PASSED! - I am a cosponsor of this legislation. Passed 67-2 in the House and 23-0 in the Senate. This bill makes serious reforms to the State's criminal justice program. The overall goal of this bill was to reduce the recidivism rate. To accomplish this goal, the bill greatly enhances treatment options for inmates struggling with addiction and/or mental illness. It also drops drug possession from a felony to a misdemeanor and reduces the punishment for some traffic offenses. It also institutes a new screening survey to identify offenders who have an addiction or a mental illness and directs them into treatment while they are incarcerated and when they are released. HB14 - Appropriations Limit and Mathematical Formula - PASSED! - I am the chief sponsor of this bill. Passed 67-0 in the House and 23-0 in the Senate. This bill can only be loved by math nerds like myself. There are sections of the state Code that deal with technical issues regarding where money comes from and where it should go. Instead of just writing these technical instructions in text, it will be simpler (for those who have to actually implement the policy) to put such instructions in formula mode. This bill provides the mechanism necessary to put together more of these in the future, if it proves helpful. HB93 - School District Amendments - Did not pass. I am the chief sponsor of this bill. Passed the House 56-8. Was not heard in the Senate. HB93 protects communities from unfair school district splits. It basically prohibits cities from cherry-picking its best tax base and creating its own school district, leaving their less affluent neighbors high and dry. This bill would have protected all families, students and taxpayers within District 33. Thanks for all those who attended any of my three Town Hall meetings throughout the session. 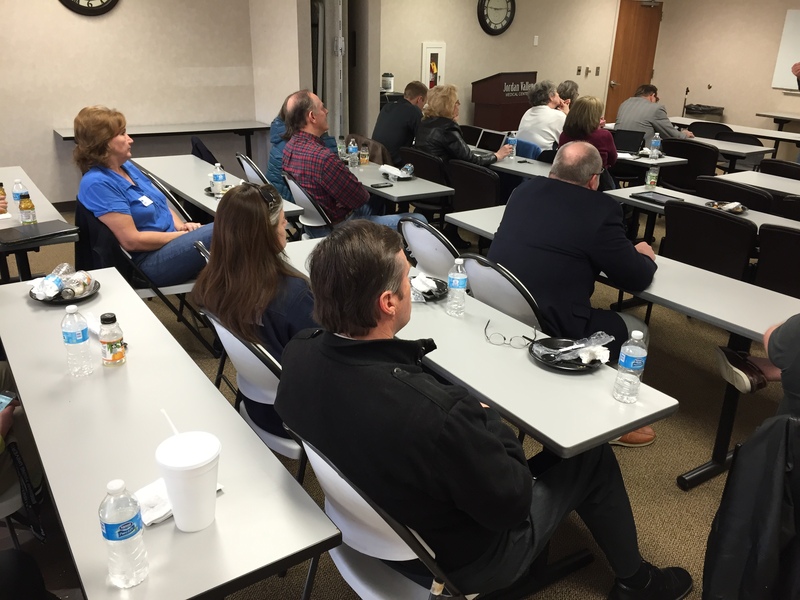 Above is a photo of some of those who came to one of the meetings. I greatly appreciate all of your thoughts and opinions. We stayed to work on bills until 12:00 midnight on March 12. 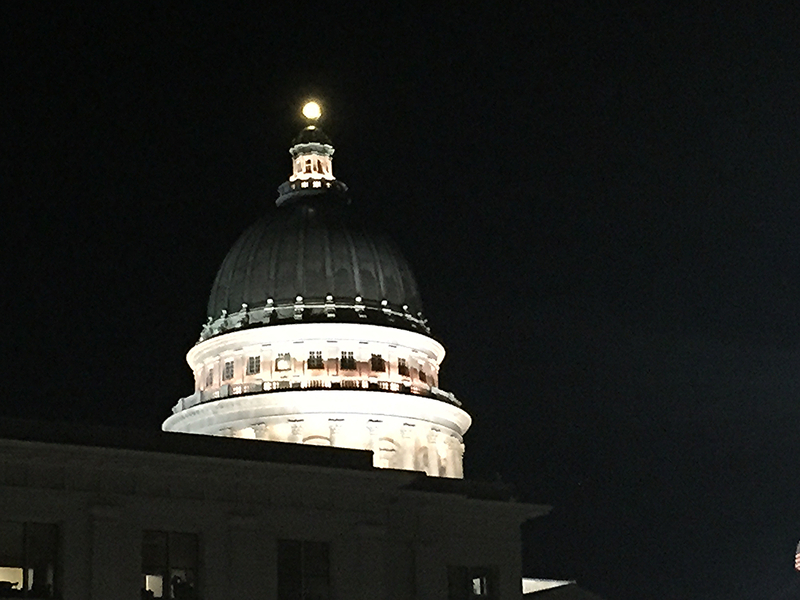 This is a photo of the Capitol at 1:30 a.m. after I left the Capitol. It has truly been an honor to represent District 33. Thank you for the opportunity!